Volunteer collects ballots at 2008 convention in Winnipeg. When Lutheran Church–Canada restructured in 2002 it eliminated a number of elected boards and commissions. 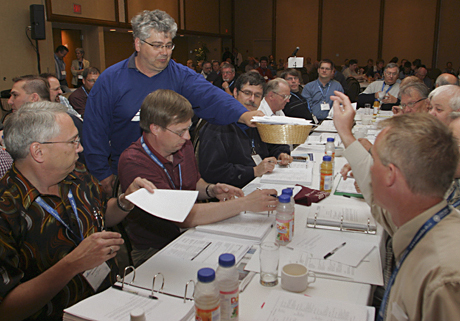 At Synod’s 2011 convention in Hamilton, June 3-6, delegates will need to elect a president, three vice-presidents and 18 people to serve on LCC’s Board of Directors, three Boards of Regents and two Commissions. The Nominations Committee draws candidates for the boards and commissions from names supplied by the church-at-large, lay persons, clergy and deacons. The committee is currently building the list and invites any member of an LCC congregation to submit a recommendation for a nominee. The form to fill in is at www.lutheranchurch.ca/synod2011 along with job descriptions. Mr. Heinemann noted that most boards and commissions meet at most four times each year in person, online or by teleconference and, to provide continuity, ask those elected to serve a six-year term. Boards and commissions have regional representation from each of LCC’s three districts which, due to term limitations, change with each convention. • one pastor and two laypersons to Concordia University College of Alberta’s Board of Regents. If you know someone the Nominations Committee should consider for any of these positions, ask the person’s permission then go to www.lutheranchurch.ca/synod2011 and fill in the form. The Secretary of Synod, Rev. Dennis Putzman, will contact each person to ask if he or she will stand for possible nomination and election. Deadline for submitting names is September 30, 2010. Congregations will receive ballots for the president and vice-president nominations separately.